A family is seen partying on the hard shoulder of an expressway in northern Vietnam in this still photo taken from a Facebook live-stream video. 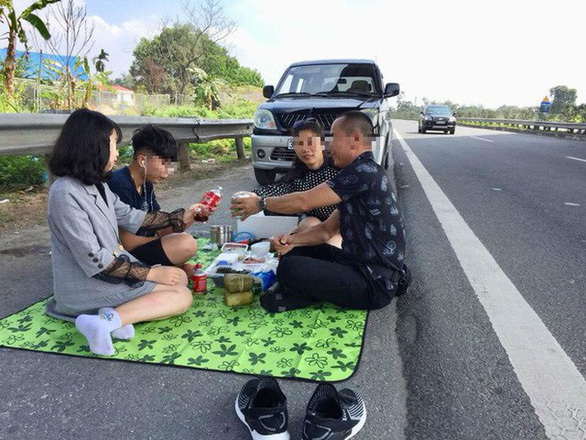 On the second day of the national holiday to observe Tet, or the Lunar New Year, in Vietnam, a local family chose an unusual venue to throw a picnic party - the shoulder of a major expressway linking Hanoi with a neighboring province, and live-streamed their celebration on Facebook. The live-stream video of the family of four drinking and eating in front of their car, whose license plate is clearly visible, on the hard shoulder of the Noi Bai - Lao Cai Expressway was quick to attract negative comments from Facebook users after it surfaced on Wednesday. Vehicles were seen speeding past the Mitsubishi Jolie with the license plate of BKS 36A – 090.48, and the four people, apparently a son and daughter and their parents, picnicking on a carpet laid along the emergency stopping lane of the 265-km expressway. The reckless act of the family has sparked widespread outrage as they did not risk their own lives but also those of other traffic goers on the expressway that connects Hanoi and Lao Cai Province. The management board of the Noi Bai - Lao Cai Expressway said on Thursday they were aware of the exact location where the family threw their picnic party and already notified the local traffic police unit to handle the case. 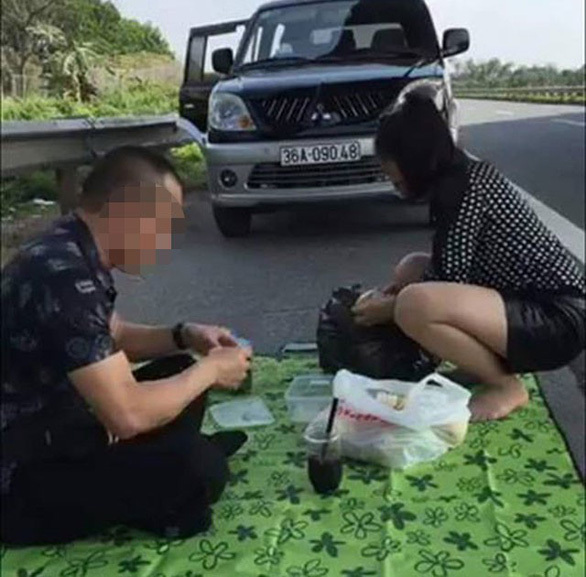 Vietnam’s National Committee for Traffic Safety has said the act of picnicking on the shoulder of the expressway is a serious traffic law violation. It did not say how the violation would be punished.  Also on Thursday, An Toan Giao Thong (Traffic Safety), a news website run by the Ministry of Transport, reported that the father of the family took to Facebook to express his apologies over the incident. Speaking “on behalf of [his] family,” the man said they did not mean to party on the expressway, adding that what they did was “a thoughtless act.” The father and husband also sought “sympathy and forgiveness” for his family through the Facebook post, according to An Toan Giao Thong. In the latest development, Uong Huy Hoang, director of the Vietnam Expressway Operation and Maintenance JSC, told Tuoi Tre (Youth) newspaper on Friday a unit of the Traffic Police Department under the Ministry of Public Security had booked the case and will continue to deal with the violation.